The two major types of paint are oil-based and water-based paints. Oil based paints are manufactured with a petrochemical product, usually mineral spirits or toluene, as a solvent. These paints include enamels, shellacs, lacquers, stains, seals, polyurethanes, and more. When storing small to large amounts of paint in your facility it is necessary that precautionary measures are met. Keep your paints stored in a fire rated chemical storage building for full compliance. Paints contain additives, pigments and chemicals that can be harmful to humans and the environment if not disposed of properly. In older paints, lead was a common additive to make the paint harder, last longer and be more resistant to weathering. Paints also may contain mercury, depending on what paint you are buying. History of Mercury in Latex Paint: The EPA announced June of 1990 that it was banning the use of mercury in interior latex paint. If paints were to be produced with mercury, warning labels would be implemented on the exterior of paint products. Paint waste, whether liquid or solid, must be properly disposed of in a flammable storage containment for paint that can handle proper flammables and hazardous materials. US Chemical Storage offers a safe and secure flammable storage containment for paint and other hazardous materials. The flammable storage containment for paint storage is fire-rated for complete protection and safety purposes. All flammable storage containment facilities are tested before they leave the facility to ensure full compliance. Built from heavy-gauge steel for strength and reliability, and featuring a built-in, leak-proof secondary sump containment for safety and security. 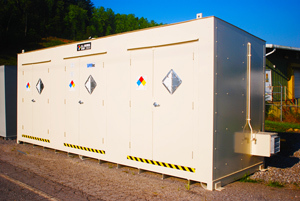 All flammable storage buildings are finished with a chemical resistant and weather resistant epoxy coating for handling extreme weathering conditions and chemical spills. Choose from a wide variety of customizable accessories by US Chemical Storage for complete compliance and maximum safety. Our Strength is Your Security.